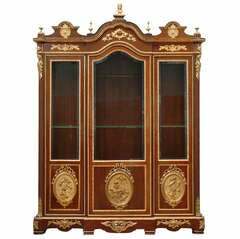 Crafted by the acclaimed cabinetmaker, Charles-Guillaume Diehl (1811-1885), this tobacco (humidor) cabinet is a truly exquisite piece of antique oak furniture. 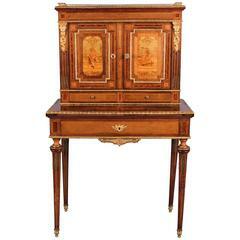 Diehl was famous in the 19th century for his furniture, which was often decorated with fine marquetry work, or expertly-cast bronze mounts. His furniture won multiple awards at the international exhibitions of the 1850s and 1860s, and today his work is displayed in major museums and collections, including the Musée d'Orsay in Paris and the Metropolitan Museum of Art in New York. 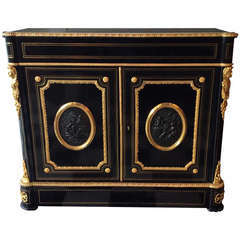 This cabinet forms part of a group of similar pieces, which differ only slightly from one another in their wood type, or style of decoration. 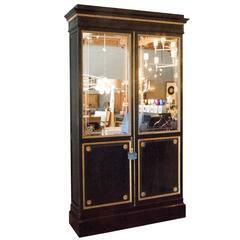 The tobacco cabinet features a rectangular body, topped by a slightly raised roof, decorated with silvered bronze winged mounts and a four-headed horse finial. A silvered bronze scene, depicting Apollo driving his chariot across the sky, decorates the front of the cabinet body. 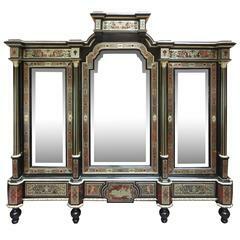 This is bordered by silvered bronze stylised anthemion and laurel wreath mounts. This front façade forms a door, which can be opened to reveal four caned drawers, originally used in the 19th century for storing cigarettes, cigars, and pipe tobacco. Beneath this cupboard, there is a frieze drawer, mounted with a silvered bronze chain of patera (dishes) and diapers. The lower section features a shaped apron, decorated with a silvered bronze anthemion, and the corner peg joints are articulated by silvered bronze pierced bosses. Four tapering square legs, with turned tops, raise the cabinet body off the ground. These are decorated with silvered bronze leaves, and are linked by a stretcher, centred by an urn. The four legs terminate in peg feet, with silvered bronze tips. 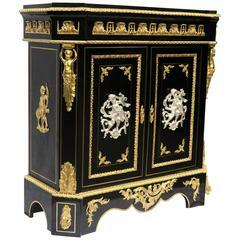 Formed with three mirrored doors to the front, separated by fluted columns and decorated with inlaid brass, tortoiseshell and ebonized wood with ormolu mounts, on bun feet. The small vitrine above the cabinet set with two porcelain plaques depicting flowers, the lock signed 'L GRADE 23 rue de la Paix PARIS'. Paint loss. One of the shelves missing. 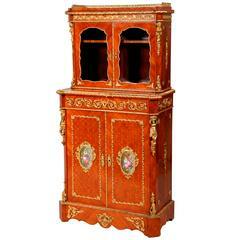 This cabinet is the perfect spot to display all of your quirky curio items.